MI6 looks back at James Bond's obituary published in The Times during Ian Fleming's novel "You Only Live Twice"
In the world of secret agents and espionage, death is a very real element. This same truth applies to James Bond’s universe. Throughout the films, we see Bond as directly and indirectly responsible for the deaths of villains and henchmen of all shapes and sizes. Along the way, many of Bond’s closest allies have lost their lives, as well: Quarrel in Dr. No, Kerim Bey in From Russia With Love – the list is seemingly endless. Even Bond’s wife, Tracy, was killed by his nemesis, Blofeld, in On Her Majesty’s Secret Service. But what would happen if James Bond, himself, were to die? While Bond has gotten in and out of some sticky situations throughout the films, the character Ian Fleming wrote about in his novels and short stories had many more “close calls”. In many of the books, we see Bond being tortured till he is on the verge of dying, and then somehow finding the will to survive. At one point, Fleming grew tired of the character, and intended to have James Bond murdered at the end of the novel, From Russia With Love. 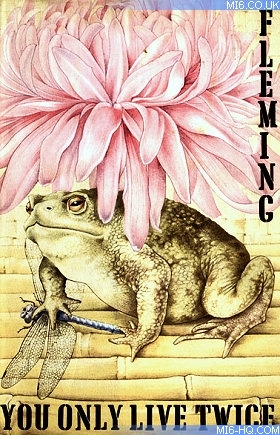 Somehow, though, Fleming was persuaded to “resurrect” his creation, and continue the series with Dr. No. 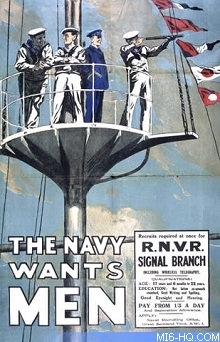 Above: Recruitment poster (National Archives). In the film You Only Live Twice, we see James Bond’s funeral, albeit fake. But in the novel by the same title, we actually get to read James Bond’s obituary, written by his boss, M. (Ironically, James Bond’s obituary appears in the last Bond novel Fleming completed. Ian Fleming would die before finishing the manuscript for The Man with the Golden Gun.) What makes Bond’s obituary important, though, is that it is the first time Fleming really gives much background info on who James Bond really is and where he came from. Much can be learned about James Bond just from the way he is addressed at the beginning of the obituary: “Commander James Bond, C.M.G., R.N.V.R.” Both “Commander” and “R.N.V.R.” refer to Bond’s military service. The R.N.V.R. (or Royal Navy Volunteer Reserve) was founded in 1903 in response to the threat of Germany’s growing navy. Members of the R.N.V.R. served not only at sea, but also on land and in the air, with some 70,000 members serving in World War I, and as many as half a million reservists serving in World War II. The R.N.V.R. was dissolved in 1958, and would-be members are now a part of the Royal Naval Reserve (R.N.R.). James Bond entered the R.N.V.R. during WWII at the rank of Lieutenant, and by the end of the war, he had attained the rank of Commander. The letters “C.M.G.” refer back to the novel, From Russia With Love, in which we read that James Bond was made a Companion in the Order of St. Michael and St. George in 1954. This order today is given to those who either a) have held or will hold a high office, or who b) have performed – as in James Bond’s case – an extraordinary or important non-military service in a foreign country. 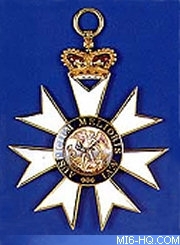 Members of the Order receive a badge such as the one pictured here. The motto is AUSPICIUM MELIORIS AEVI ('Token of a better age'). The front of the badge shows St. Michael subduing Satan, and the reverse of the badge shows St. George and killing a dragon. A Companion of the Order – such as James Bond – would wear the badge suspended from a ribbon around the neck on formal occasions. Unlike the film, in which James Bond’s death was faked on purpose by MI6, in the You Only Live Twice novel, M writes Bond’s obituary when Bond is missing, presumed dead, at the end of a mission. After a short introduction, M begins to give us a brief biography of James Bond. According to M, James Bond’s father was a Andrew Bond, of Glencoe, Scotland, and his mother was Monique Delacroix, from the Canton de Vaud, in southwestern Switzerland. Andrew Bond was a foreign representative of the Vickers armament firm, and James traveled with his parents wherever the work took them. When James was eleven years old, both of his parents were killed in a climbing accident in the Aiguilles Rouges, in eastern France. Because of his parents’ traveling, James Bond’s early education was entirely abroad, and he became fluent in both French and German. After his parents’ death, young James went to live with his aunt, Miss Charmian Bond in Pett Bottom, a hamlet near Canterbury. Then at the age of twelve, James entered at Eton College, but after a year, M writes, there was “some alleged trouble with one of the boys’ maids”, and James transferred to Fettes, where he took part in wrestling, founded a judo class, and graduated early at the age of seventeen. Now according to the obituary, upon his graduation from Fettes (still at age seventeen), one of James Bond’s father’s colleagues helped him to enter the Special Branch of the R.N.V.R. by claiming that Bond was actually nineteen years old. There is some confusion here, however, because M claims that this happened in 1941, but in From Russia With Love, we read that James Bond began his service in 1938 (even though Bond was only fourteen in 1938, according to M). At the end of WWII, James Bond began working for MI6. Of course M couldn’t mention the nature of Bond’s missions in such a public forum as an obituary in a newspaper, but he does speak highly of Bond’s work, going so far as to claim that Bond possessed “The Nelson Touch” (the ability the command loyalty and draw out the skills and abilities of those around him) in emergency situations. In a brief humorous moment, M mentions the novels made about James Bond, explaining that Bond’s missions had gained some publicity in foreign press, and that “If the quality of these books, or the degree of their veracity, had been any higher, the author would certainly have been prosecuted under the Official Secrets Act.” M goes on to refer to the Bond novels as “fictions” and “highly romanticized caricatures” of Bond’s career. Wrapping up, M refers back to the events of On Her Majesty’s Secret Service, mentioning Bond’s brief marriage to Teresa Di Vicenzo in 1962, and the fact that Bond had no other living relatives. The very end of the obituary was written by someone denoted merely as “M.G.”, who claims to have served under Bond for three years at the Ministry of Defence (this is Mary Goodnight, who was secretary to the 00 section in some of the novels). M.G. suggests that if indeed James Bond is dead, these words would summarize Bond’s philosophy of life, and would be fitting for his epitaph: "I shall not waste my days in trying to prolong them. I shall use my time." Commander James Bond, C.M.G., R.N.V.R. As your readers will have learned from earlier issues, a senior officer of the Ministry of Defence, Commander James Bond, C.M.G., R.N.V.R., is missing, believed killed, while on an official mission to Japan. It grieves me to have to report that hopes of his survival must now be abandoned. It therefore falls to my lot, as the Head of the Department he served so well, to give some account of this officer and of his outstanding services to his country. James Bond was born of a Scottish father, Andrew Bond of Glencoe, and a Swiss mother, Monique Delacroix, from the Canton de Vaud. His father being a foreign representative of the Vickers armaments firm, his early education, from which he inherited a first-class command of French and German, was entirely abroad. When he was eleven years of age, both his parents were killed in a climbing accident in the Aiguilles Rouges above Chamonix, and the youth came under the guardianship of an aunt, since deceased, Miss Charmian Bond, and went to live with her at the quaintly-named hamlet of Pett Bottom near Canterbury in Kent. There, in a small cottage hard by the attractive Duck Inn, his aunt, who must have been a most erudite and accomplished lady, completed his education for an English public school, and, at the age of twelve or thereabouts, he passed satisfactorily into Eton, for which College he had been entered at his birth by his father. It must be admitted that his career at Eton was brief and undistinguished and, after only two halves, as a result, it pains me to record, of some alleged trouble with one of the boys' maids, his aunt was requested to remove him. She managed to obtain his transfer to Fettes, his father's old school. Here the atmosphere was somewhat Calvinistic, and both academic and athletic standards were rigourous. Nevertheless, though inclined to be solitary by nature, he established some firm friendships among the traditionally famous athletic circles at the school. By the time he left, at the early age of seventeen, he had twice fought for the school as a light-weight and had, in addition, founded the first serious judo class at a British public school. By now it was 1941 and, by claiming an age of nineteen and with the help of an old Vickers colleague of his father, he entered a branch of what was subsequently to become the Ministry of Defence. To serve the confidential nature of his duties, he was accorded the rank of lieutenant in the Special Branch of the R.N.V.R., and it is a measure of the satisfaction his services gave to his superiors that he ended the war with the rank of Commander. It was about this time that the writer became associated with certain aspects of the Ministry's work, and it was with much gratification that I accepted Commander Bond's post-war application to continue working for the Ministry in which, at the time of his lamented disappearance, he had risen to the rank of Principal Officer in the Civil Service. The nature of Commander Bond's duties with the Ministry, which were, incidentally, recognized by the appointment of C.M.G. in 1954, must remain confidential, nay secret, but his colleagues at the Ministry will allow that he performed them with outstanding bravery and distinction, although occasionally, through an impetuous strain in his nature, with a streak of the foolhardy that brought him in conflict with higher authority. But he possessed what almost amounted to "The Nelson Touch" in moments of the highest emergency, and he somehow contrived to escape more or less unscathed from the many adventurous paths down which his duties led him. The inevitable publicity, particularly in the foreign press, accorded some of these adventures, made him, much against his will, something of a public figure, with the inevitable result that a series of popular books came to be written around him by a personal friend and former colleague of James Bond. If the quality of these books, or their degree of veracity, had been any higher, the author would certainly have been prosecuted under the Official Secrets Act. It is a measure of the disdain in which these fictions are held at the Ministry, that action has not yet -- I emphasize the qualification -- been taken against the author and publisher of these high-flown and romanticized caricatures of episodes in the career of a outstanding public servant. It only remains to conclude this brief in memoriam by assuring his friends that Commander Bond's last mission was one of supreme importance to the State. Although it now appears that, alas, he will not return from it, I have the authority of the highest quarters in the land to confirm that the mission proved to be one hundred per cent successful. It is no exaggeration to pronounce unequivocally that, through the recent valorous efforts of this one man, the Safety of the Realm has received mighty reassurance. James Bond was briefly married in 1962, to Teresa, only daughter of Marc-Ange Draco, of Marseilles. The marriage ended in tragic circumstances that were reported in the press at the time. There was no issue of the marriage and James Bond leaves, so far as I am aware, no relative living.